Eaton has launched its VSQ (Vane-Speed-Quiet) pump series designed to provide operators with a minimum speed range of 0-50 RPM to decrease energy usage and improve efficiency in dynamic industrial applications like injection moulding, metal forming, die casting and press brake. The VSQ vane pumps combines the features of vane pumps with 0 RMP low speed capable architecture to support efficiency and energy savings up to 70%. These VSQ vane pumps feature a minimum speed range between 0-50 RPM and maximum speed up to 3,000 RPM. The new VSQ series is also capable of a two quadrant operation. 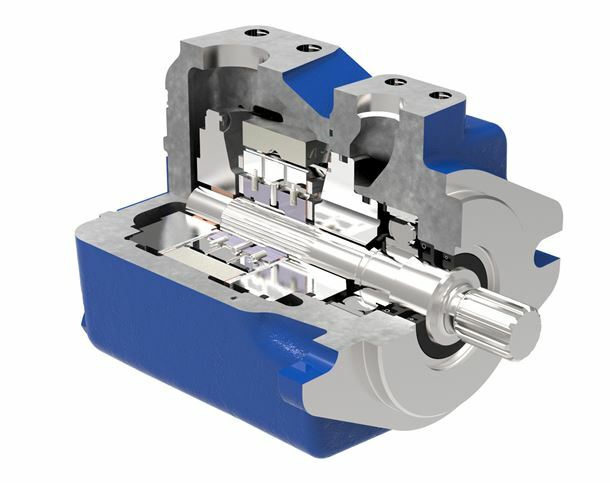 High operating pressures of up to 290 bar reduce pump sizes and the small size helps minimize installation costs. The Eaton VSQ vane pump forms a compact unit in combination with flange and E-motor. The modular design allows for flexibility in displacement, mounting and port options. A cartridge kit design feature allows for easy repair and interchangeability between pumps. The pumps aim to combine high efficiency with low noise characteristics.